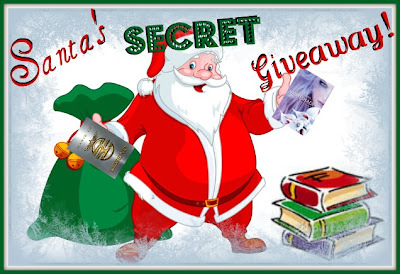 Good Choice Reading: Santa's Secret Giveaway! To do a little "Happy Dance!" Just how giving we can be! A box of books!" Won't that be fun? Don't like poems? Here are the rules in plain English! Good Choice Reading, Reading Teen, and Once Upon a Twilight are each giving away a box of books (mostly ARCs). What books you'll get is a secret, but they will be good! Visit each blog and enter their giveaway to have three different chances to win. Giveaway is US only (Sorry, box= too expensive for International). GOOD CHOICE READING HAS A BOX FROM SANTA WITH OVER 10 BOOKS JUST FOR YOU. All OLD and NEW (YA) ARCs! Please read all INSTRUCTIONS before clicking on I DID THIS. You must sign in to Rafflecopter with either your Facebook, or click below to enter your name and e-mail. From there it will give you other options. Good Luck! Make sure to check out Once Upon A Twilight, and Reading Teen for their Santa's Secret Giveaway! What a great giveaway. I'm curious as to what is in these boxes. Great idea for a christmas giveaway. Awesome poem and giveaway! Happy Holidays! Very nice poem! Thanks for the super awesome giveaway! Oh, a box of books! What a great Christmas present that would be to me! A Secret Santa surprise, those are always a lot of fun. I love surprises!!! Thanks for the chance. Cute poem! Thanks for the chance to win and Happy Holidays! This sounds AMAZING!!! Happy Holidays, all! What a fun giveaway! Merry Christmas! I would love to win this. This is a great giveaway! What a darling poem! This giveaway is fantastic. Great giveaway! It's really exciting to not know what the prize is! This is a great giveaway! Thank you for this chance! I'm squeeing so very hard right now at the thought of all those books! Love the secret Santa part! Merry Christmas! It really would be fun to win a box of books! Thank you for the give away and Happy Holidays to all! Thanks for the opportunity to win/review a box of books! I love reading and writing YA! Check out my blog when you get a chance. Thank you!